Easter is coming up soon and it’s hard not to think about colored eggs, fluffy bunnies, and hopefully, some great online casino bonuses to celebrate the holiday weekend. 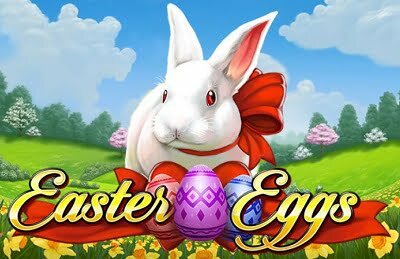 Although these offers have yet to arrive in our inbox, we’ve already discovered a number of Easter themed slot games, with more coming out by the day. One of the first so far is Easter Eggs Slots that’s set in a spring inspired grassy meadow, littered with daffodils and tulips, and surrounded by mountains. Collect chicks, lambs and rabbits, and land on the “Wild Golden Egg” to increase your chances of snagging a big win. This title also offers various special features requiring that you collect candy-filled egg symbols that are complimented by scatters, multipliers, and free spins galore. Next up is the whacky Super Duper Crazy Chicken Easter Egg Slots – a 20 payline title with a ridiculous name and an even more ridiculous theme. Set in ancient Egypt, symbols include scarab beetles, jewels, urns…and chickens dressed up in khakis. Even though this one sounds silly, with a 96.1% Return to Player (RTP) it’s one of the highest paying slots you’ll find this year that’s Easter-themed. It also has beautiful graphics and an “Easter Egg” icon that will remind you why there are chickens in this machine. It boasts a unique virtual “Ladder Bonus” and each win results in better prizes: the higher it reaches, the more it pays. Surprisingly, the aforementioned is not the only Egypt-themed Easter title out right now. Ramses Book: Easter Egg Slots is set among the pyramids of Giza in Egypt. This 10 payline title has an RTP of 96% and offers symbols of a flower, bird, cat, obelisk and pharaoh that offer rewards of up to 50,000 times stake. You may be asking yourself, where the heck does Easter come in? Well, with chocolate eggs and rabbit ears on display behind the reels, it definitely feels like Easter. Finally, Mammoth Chase: Easter Edition Slots was recently released by Kalamba Games with an RTP that exceeds the other titles highlighted here (96.9%). It has an Easter egg hunt theme where you collect symbols that you’d expect from a game based on the holiday like eggs, chickens and rabbits. However, it also comes with 4,096 ways to win, a three-level jackpot and outstanding graphics: this one will undoubtedly be most people’s favorite of the bunch. There will surely be more titles released in the coming weeks and we’ll have the details of all of them here for you so check back soon. Now go get started on your egg painting!